When choosing entertainment for your drinks reception, you may not have a clue where to start! Whether it’s a private party, corporate event or even a festival we have some awesome entertainment options for you! An incredible soul and jazz duo – The Duplettes are a sophisticated and talented acoustic duo providing a combination of Jim the guitarist and Anna May’s flawless vocals. Having an abundance of event experience under their belts, these two are something not to be missed. 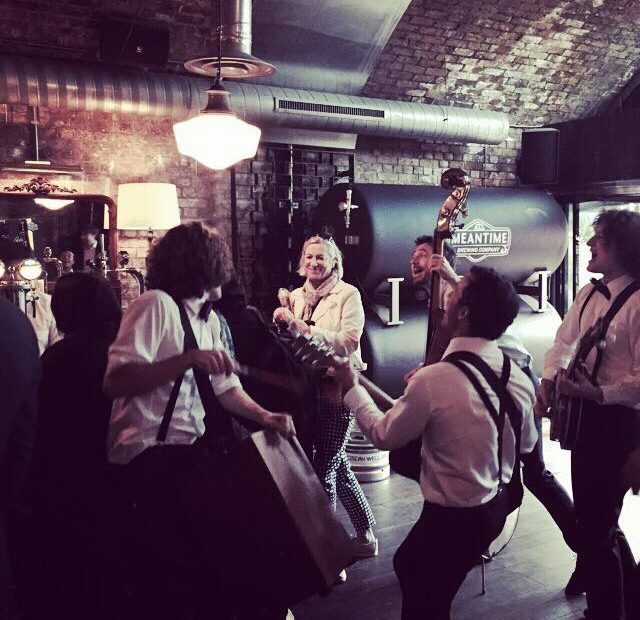 A cheeky four piece acoustic act – A group of expert musicians, perfect for performing on stage or roaming through crowds. Four charming chaps with heaps of personality and talent that present everyones favourite songs with tight harmonies and superb musicianship. 2 Voices and 2 Guitars – This duo pride themselves in breaking the ‘norm’ when it comes to acoustic duos. Mixing up songs with unexpected twists and providing a catalogue of popular songs ranging from the 60’s to present day. A versatile act that cater to the vibe of every event. Acoustic rockabilly quartet – A four piece acoustic band providing rockabilly versions of latest hits whilst throwing in some fantastic classics too. Giving beats that the audience cannot resist bopping too, Bella Bella are immensely talented and utterly fabulous. An irresistible band spilling with personality that bring something a little different to the stage. They can even do roaming events! Collaboration of live vocals, sax, violin and DJ –Renowned as an incredible party experience, this heavenly concoction of talent can also do smooth house and lounge sets that are perfect for cocktail receptions. Acoustic duo version of Hoxton – These guys are totally passionate about what they do, giving 110% in every performance. The duo version of Hoxton is a pure combination of delicious vocals and acoustic guitar mixing up your favourite songs and making them their own. We have many other amazing bands and incredible DJ’s that could also suit your event, if in doubt we are always here to help!